So the market closed the month up 5.2%, the best performance since 1997. And if you want to see what happened the rest of 1997, look at the second chart.. it went up 25% more. Obviously, it would be a fallacy.. a gambler's fallacy to be exact, to assume that past results affects future performance. But sometimes these past performances are worth a look as one can see how the market deals with momentum. Right now the market has a strong momentum and despite many opinions (mine included) that a top is close, the fact is the market has not traded or even really tested the Trend Average for a month. 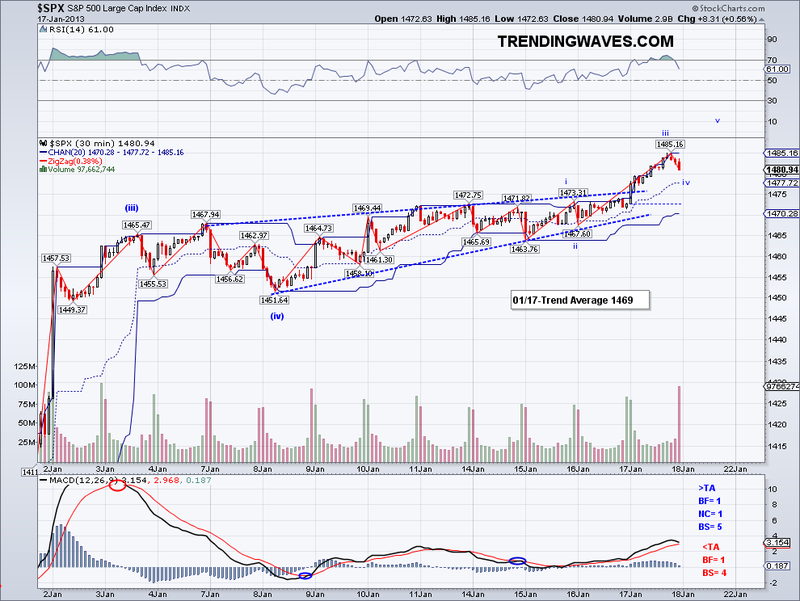 And until the market turns the TA bearish, there is top yet. February is usually a weaker month and realistically the market can't go up 5% every month. In fact, the best year the S&P500 has had in recent times is 1997 and that was a rise of 2.5% per month on average. So I won't be all that surprised when a correction does occur but for now the market has not breached key support, so we could be witnessing another sideways move before a bullish run. 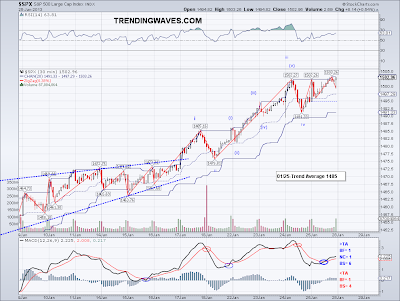 Perhaps the DOW needs to make an all time high to change all those Elliott Wave doomster counts before turning south? 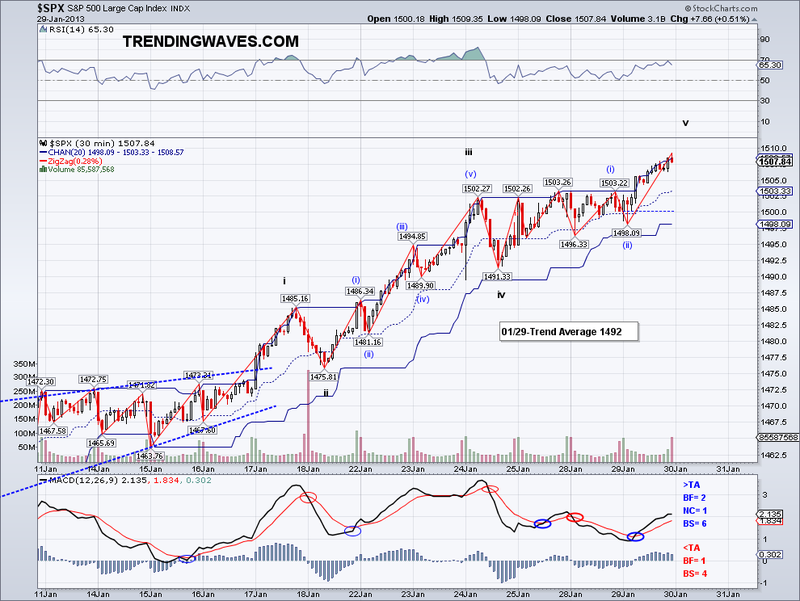 For entertainment purposes, here are couple of links of people who like to anticipate tops and are currently very bearish..
Prechter in 1996 calling for a 50% decline on the SP500 to 300.. he seemed so sure plus he had lots of fancy "in house" oscillators and expert tools.. and we see what happened in 1997. Doug Kass in 2012, who makes great calls from time to time (specially bottoms) but not so much at tops.. he started shorting late summer and the market went against him for months. So bottom line is, it's better and safer to stick to the facts.. in other words the trends. * Percentage gain for total liquid portfolio that started in September 2012, Goal is to double portfolio for retirement by September 2015, with 100% being the ideal retirement level. 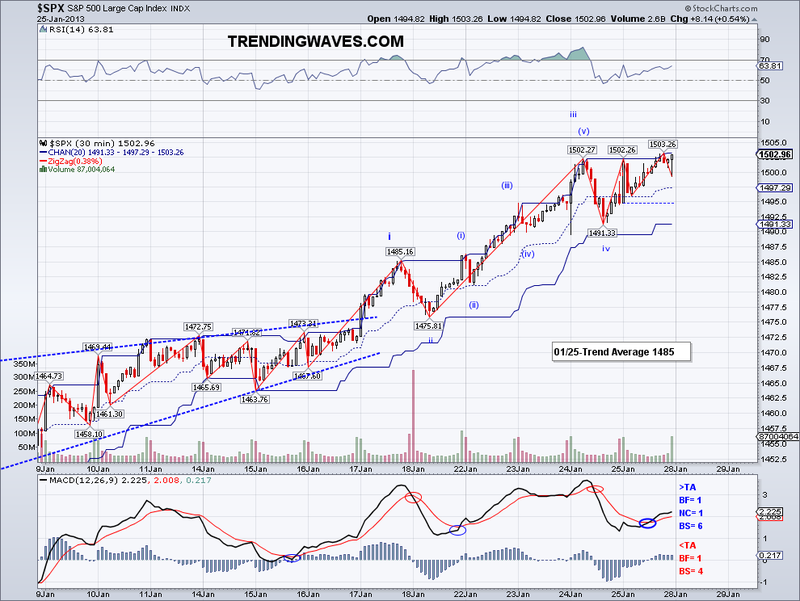 The market did not follow through on the 5 wave count I had on the chart yesterday. So that leaves two main options, one the market finally topped yesterday which has been expected for sometime or yesterday was the top of Wave 1 of this final 5th leg. It is premature to call the entire wave complete until key levels get broken, so for now I will go with the assumption the market is just putting in a Wave 2. The GDP report could have served as an excellent excuse for a sell off but it was mostly ignored. I've been saying the market will see 1600 if GDP continues to grow but if Q1 is ends up being negative as well then it will stop the bull market altogether. I think the assumption is as long as we have a weaker economy the Feds will continue to keep rates low to fuel the market and in turn the economy. I know many question this policy by the Feds but I think it's been working well so far. Using myself as an example, thanks to QE3 I now have a mortgage at 3.5% fixed (it was 4.125% last year) which saves me almost $400 a month and which will now probably end up being spent on home improvement. toys, investments, etc. And like me, there are millions of others doing the same thing and giving the economy traction going forward. So I guess time will tell if Q4 was just a blip or the beginning of a new recession. For now the markets seem to think this is nothing to worry about. "I don't believe in counts above intermediate degrees. So this is the count for the rest of the year and perhaps into 2013. 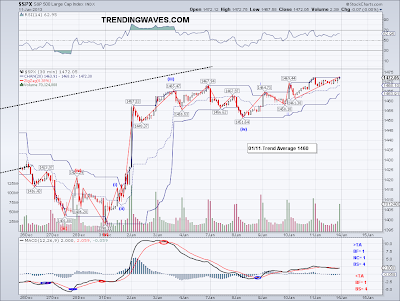 We are headed to 1510+"
I first mentioned the 1510 target almost a year ago and today the market reached it for all intent and purposes. If you look at that post from last year, I came up with that count based on what I saw on the main trends and applied a possible intermediate count. 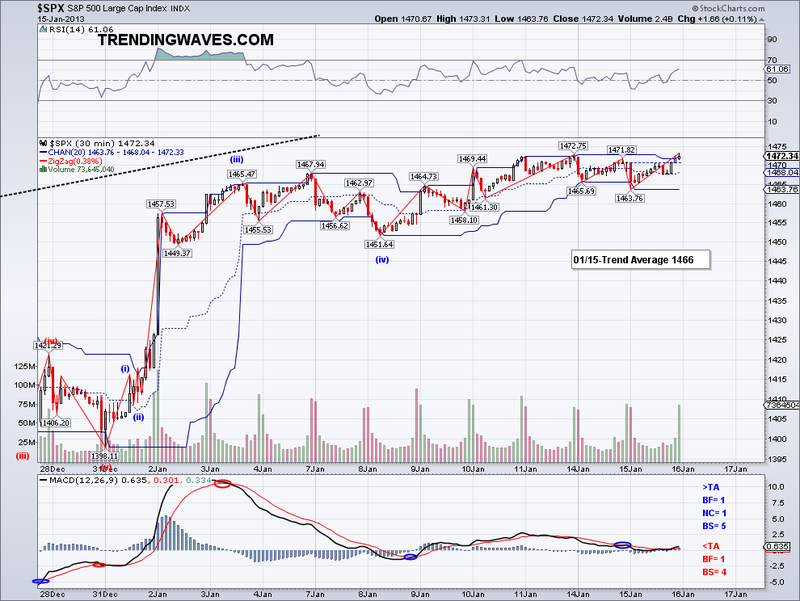 Which ultimately morphed into something else but pretty much traded on the ranges I mentioned. 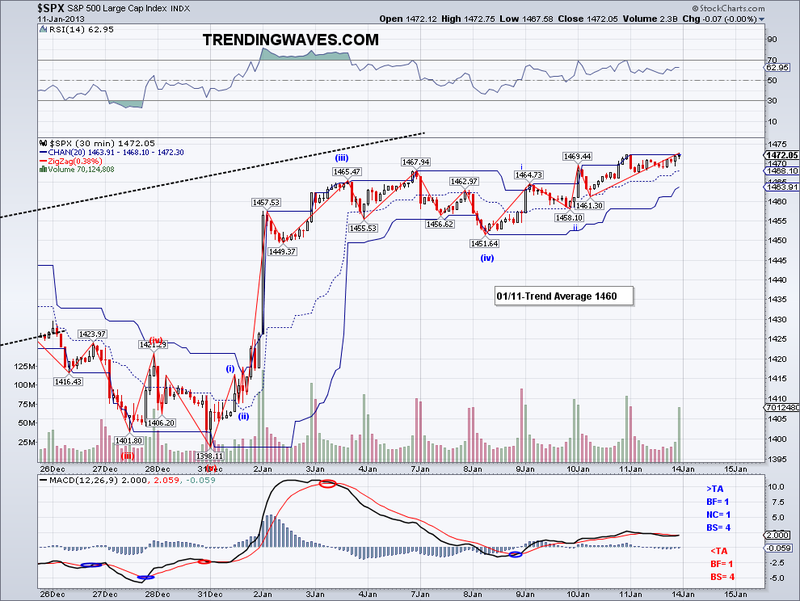 Now that we are at 1510, I am expecting more upside. Actually, a lot more upside as long as the trends remain positive and the economies around the world continue to expand. So I will draw another intermediate chart soon so you guys can see what I see as a possible path for the next few months. Just like last year, many "experts" are predicting the top for the year and that included the likes of Marc Faber (who just loves to alarm people), Doug Kass, Prechter (who calls a top every other week), etc. And while they might actually turn out to be right, if I started predicting an earthquake in California every week I would eventually be right. So the bottom line is, aside from normal and expected market corrections, the market is bullish and all trends point to significant upside at this point. 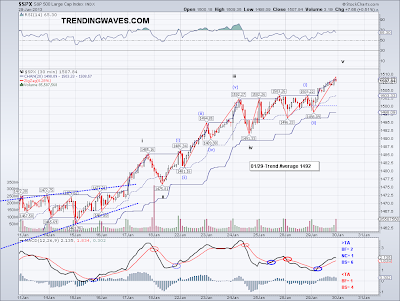 And btw HSI reached the 23,800 level I had been expecting.. in fact it is almost at 24,000 right now. 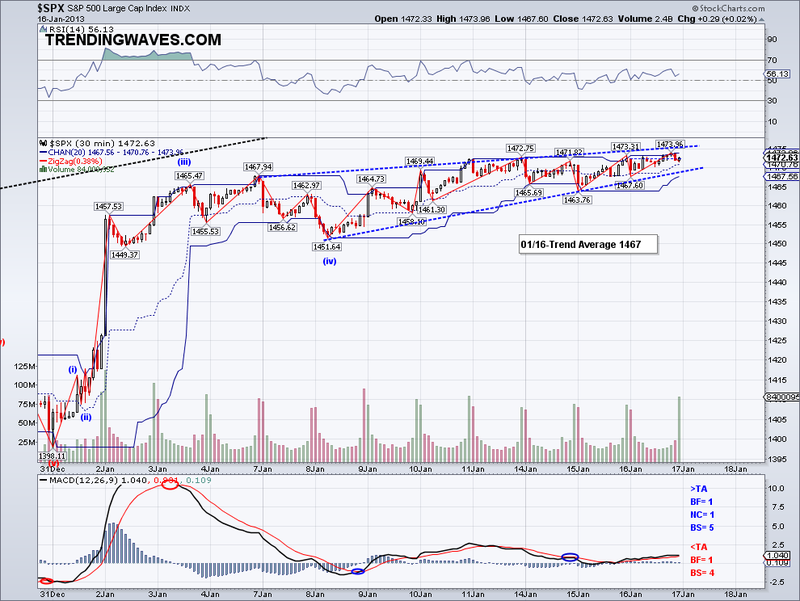 The Ascending Triangle pattern did not result in more upside today. 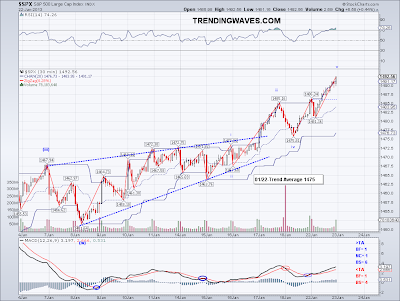 However, the same pattern still applies as it just looks like the market extended the pattern. So I am still looking for more upside before calling the entire structure complete. 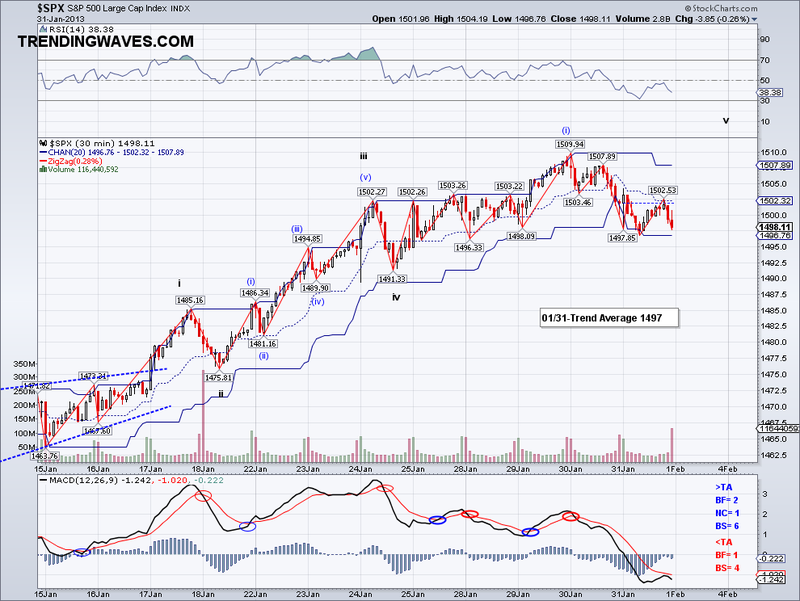 And btw, I should add that the bullish wave that started this whole impulse lack a proper W1 and W2. 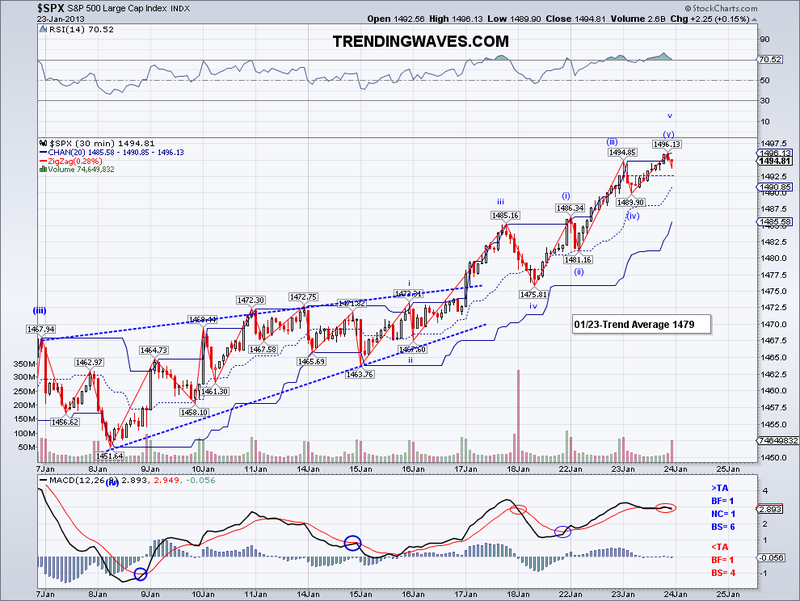 Technically, one could force it in there but for future reference I am just calling these waves stand alone W3s. And yes, I know I am coming up with my own wave rules but then again I do my own thing so I just go with what I actually see. So let's see if we get that market top this week. For now I am guessing a somewhat bearish February and then the rally will continue into May 2013, very much like last year. I trashed the bearish count posted yesterday as the market made a new high and now it looks like an Ascending Triangle is taking shape targeting 1513. I mentioned few days ago top picking was not easy and what we are seeing is just a good example. The market is very overbought and from what I read this is the longest bullish run for the S&P 500 since 2004, also the RSI has the second highest reading since 2001!. So while traditional technical analysis screams a top, the bottom line is that the Trend Average hasn't even been tested (the TA has been catching up to the market instead) and you guys know if the TA doesn't turn, the market will keep going up. I expected a rally in the US to catch up with the rest of the world when the Fiscal Cliff was resolved so I am not surprised at all, but what I have to nail down is the right count for these waves. 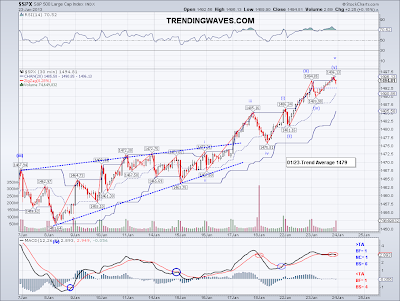 So I moved the 3rd wave one notch and now have the 4th as 1491 and if we go by this count and the 5th wave ends up equal to W1, then we magically get 1513. 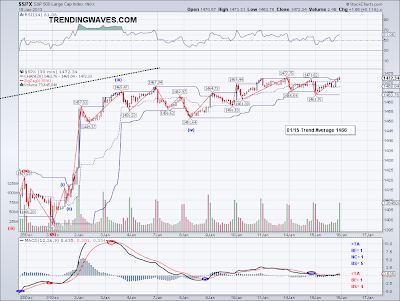 So we'll see if that works and like I've been saying lately, the question is not so much as to where the top is as I am confident we are near one now but whether the market consolidates and then does a 150 point + bull run or if it sells off as many if not most people doing wave counts are predicting. There is that bullish long term count I posted a week or two ago and the bearish rising wedge, the Trend Average will be the ultimate judge in all of this. I don't know what is the short float now on the SP500 but if the market breaks through major resistance on the next intermediate bullish wave (1565? 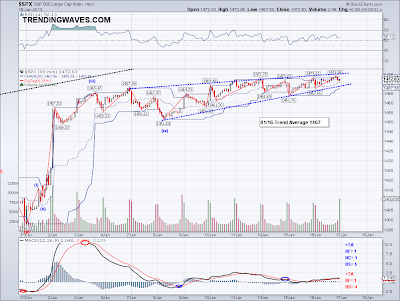 ), there should be a substantial short squeeze and many will jump on the long side. Just look at Netflix, a great company which had ALL trends on the bullish side (something I would NEVER short under those trends) yet 25% of the float was on the short side last week so when the news broke that they're actually doing just fine it went up 70%.. in one week. Talk about a shorting bloodbath.. Anyway, today I ended up selling my VXX hedge for a position trade given the Ascending Triangle and the bullish MACD cross that I follow. So I will be buying it back hopefully at 1513.. China and the HSI have rolled over and have started their correction, so the US will be catching up on the bearish side soon too. I posted last night that the correction looked like it was going to start today and the market closed about the same level as yesterday. However, the market spiked to 1502 and then reversed all its gains so despite the new high this could possibly be the start of the correction. 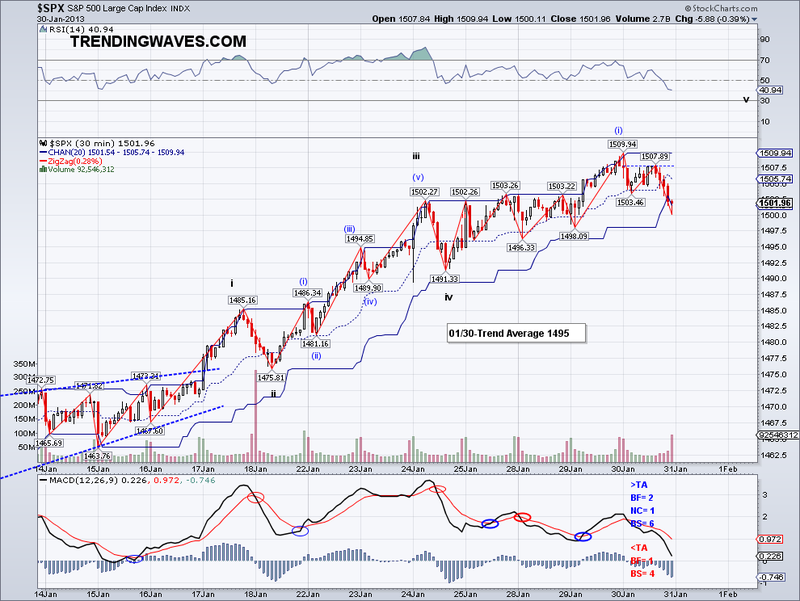 For now I am looking at the bearish W1-2 count (or ABC) and the potential head and shoulders targeting 1481 or more or less where the Trend Average is trading. The big question is whether it holds so we shall see, I am inclined to see a stronger correction before going higher but like I said couple of days ago, top picking is not easy. My plan was to buy VXX if the market went over 1500 but I was sleeping, so I'll just be patient and see how this unfolds. In a way I feel more comfortable adding that one last 1/3 position once the bearish trend is confirmed. The market should start correction tomorrow (unless the China data is used as an excuse to continue the rally) and like I said yesterday, the first stop is the Trend Average which was 1479 today. 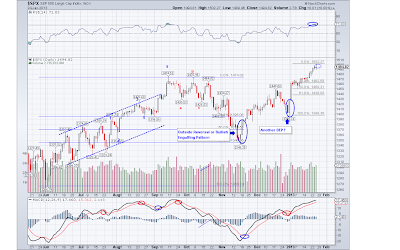 Ideally I'd like to see the market punch through the TA and then use it as resistance in a substantial correction. 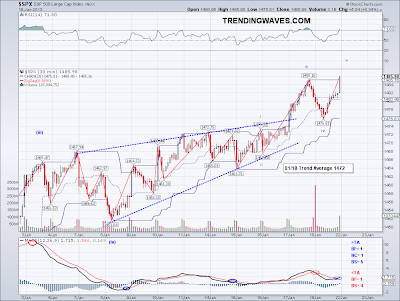 If the market uses the TA as support then the market will rally past 1500. Futures are down as I write this post so maybe we'll see a stronger gap down, if Europe sells off then the US will follow. And btw APPL is the reason futures are down and I am planning to buy me some shares when it finally reaches a bottom. 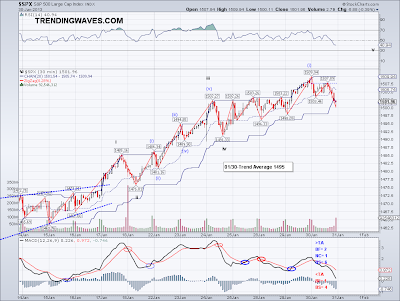 As of now, the charts look bearish as all trends have been down for quite some time now and that low on APPL that Tom Demark (the $500 per month guy) mentioned a few days ago as the "bottom" for APPL was taken out after hours, so it might get uglier for APPL and the Nasdaq in the next few sessions. But once it finds a bottom, APPL will rally hard (just like Netflix and Facebook have). I almost finalized my hedge purchase today when VXX broke $23 but I figure I'd wait just in case 1500 materializes. The market closed yet again at another post financial crisis high today at 1492, which is the level I had been projecting since December. 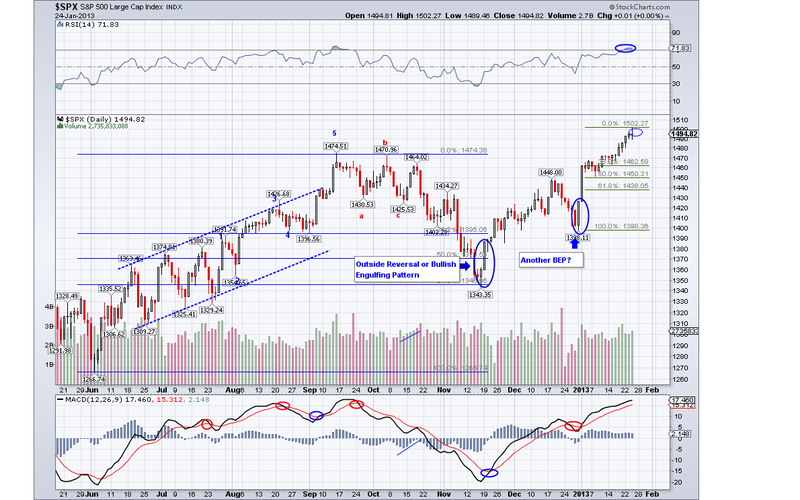 So now I am expecting the market to start stalling around here and start a correction. Top picking is difficult, so the market could still have more upside to it so while the top is around these levels imo, I could still be off by a percent or two. And like I said last week, the real question is how deep the correction will be. Right now, there is nothing in the near term that would "worry" the markets so I can't see any major corrections taking place. But for starters, maybe the market will do a test of the Trend Average in the next session or two first and once it loses TA support, then we'll see something more significant. Perma-Bears are calling for the end of the world but that's based on their hate of the rally (since they were shorting it or just missed it altogether), other known traders that I give more credibility are calling for a correction. There is Tom Demark, who charges $500 a month who projected 1492 as the high before a 5% correction, so we'll see if his projections are worth the money.. a test of the 50 DMA would be great but I'm not so sure gap support will break at this point. I ended up selling another 10% of my long portfolio, so I am keeping 80% long. 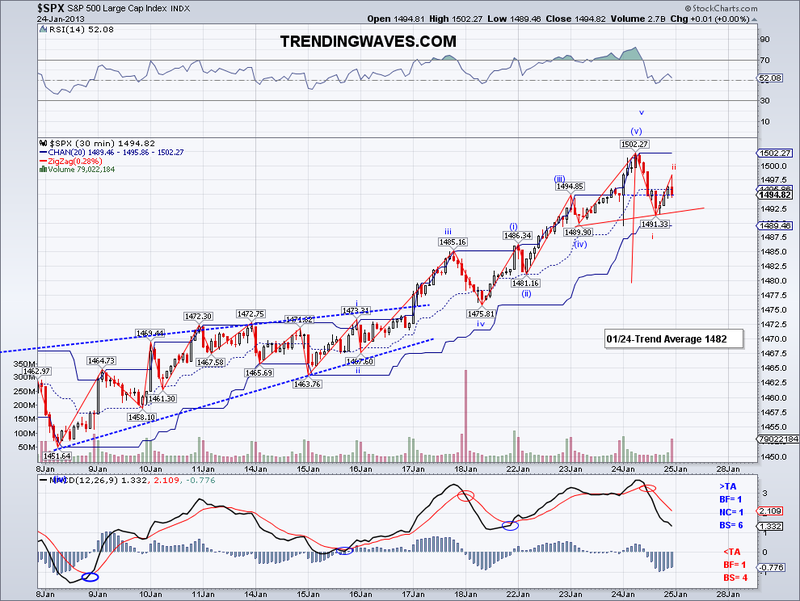 I also added another 1/3 of my expected hedge, so another 1000 VXX at $23.68 which gives me a cost average of $24.72. I had expected to buy this ETF at $25-26 but it has dropped like crazy so I'm hoping it will find some support around these levels. It'd be nice if it rallied up to $30 but I'm doubting it will even reach $27 in the current environment. And Gold btw is showing some signs of life, so maybe the correction there will be over soon. The market made another high today and the micro count posted seems to be delivering, so we could see 1490 (or even 1500) challenged early next week. 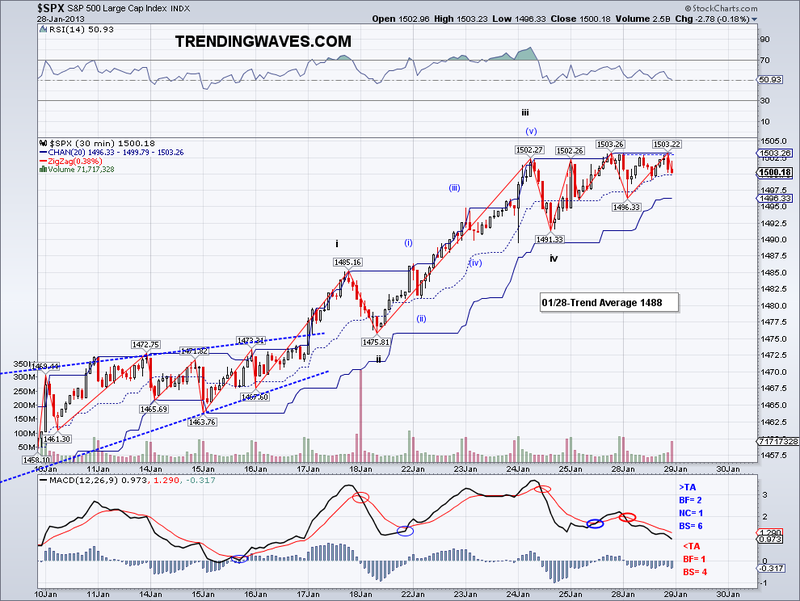 But the top is not so much the issue at this point but what the bottom will be on the correction. A test of the 50 DMA would be great but that is at 1422 at the moment and with the idea of the debt ceiling being extended 3 months being floated by Republicans, I don't think the markets have much of an excuse to correct that much. 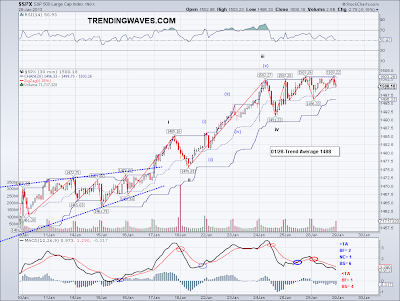 So I'd be looking at gap support or around 1450 as the correction target. It's all speculation obviously but that seems like the most attractive target to me. The VIX plummeted today because of the Republican debt ceiling idea and those VXX at bought at $25.78 are down 5%. The good news however is that my longs are at a high and the VXX portion is only 1/3 of my expected hedge, so I will be getting a bargain price on the 2/3 left perhaps even in the $23's. I am still debating whether or not I should actually sell any of my longs since I am going to hedge, as one thing I do not want to do is be net short in this market. 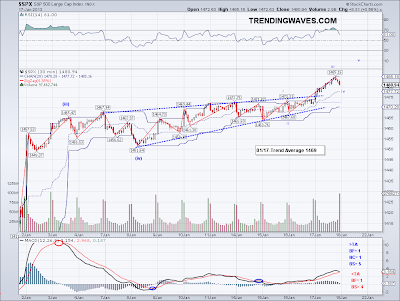 I was going to post a long term chart showing the rising wedge the bearish crowd is counting on and draw a bullish 3 rising valleys pattern (you can click here to look at a very recent example) on it so you can see what the actual bullish potential is. But I'll have to find time to do that.. The bottom line is, per that particular pattern which in Wave terms would be a nested 1-2, a BUY was confirmed when 1474 was breached so the potential of a big rally is very possible at this point. 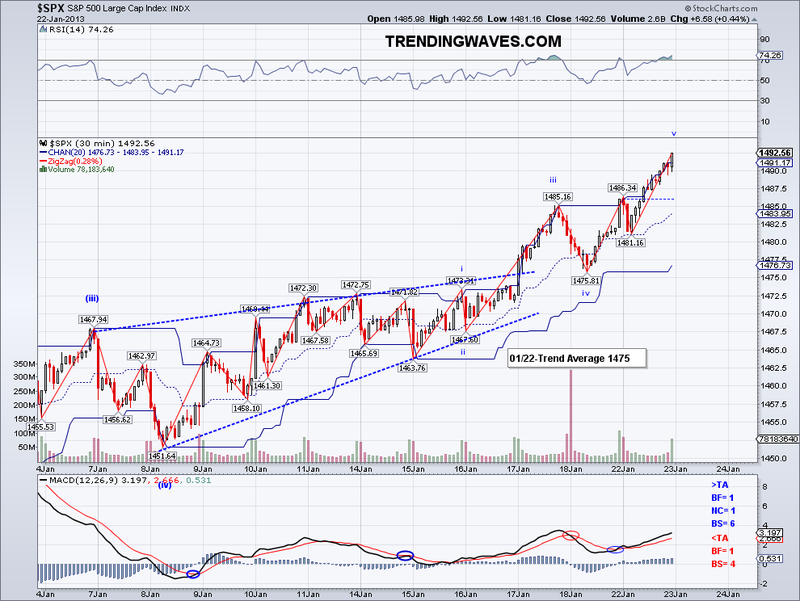 Had the market not been able to overcome the 1474 resistance, one could have argued for a double top. But the path of least resistance is now up. There are no significant bearish events in sight, except for a black swan event so my prediction of markets possibly rallying until May 2013 (which would coincide with the 3 month debt ceiling extension) has a good chance. Yesterday I mentioned than it was make or break time and the market finally broke out of its consolidation pattern and finally broke the 1474 level and now we see it trading in the 1480-1490 range I had been expecting for weeks. At the micro count level, I see 3 waves completed so there should be another wave that will put the market in the 1490's range and perhaps then we'll start seeing a decent correction. 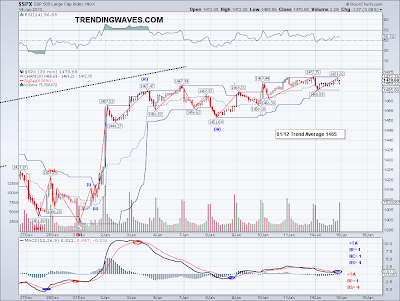 This will have to be confirmed by the break of the Trend Average, which has kept many readers of this blog on the right side of the trade during the past 2-3 weeks. 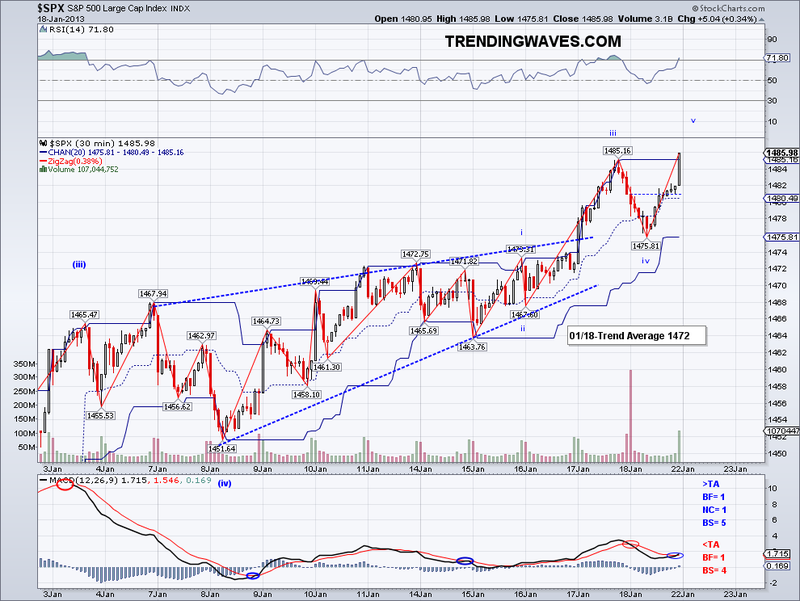 If the TA holds, it just means that 5 wave micro count is just W1 so 1500+ would be a given. 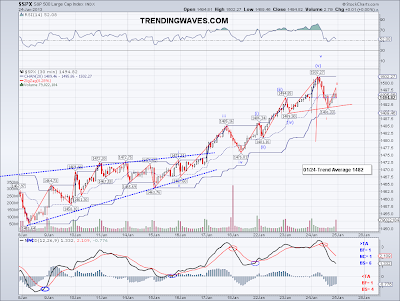 But I'd prefer a top around this level to give the market a break and shake out all the weak hands. You guys know I don't follow longer term counts as much but if I were to speculate, I would say the market is following the Long Term Count I always post. So this wave that is about to finish would be considered W1 of a W3, and that would imply a challenge to the all time high at 1575. I have seen a long term bearish rising wedge in the works but just like the one I showed yesterday, this pattern can fail and as long as the trends are bullish all these bearish predictions will fail and once 1575 breaks, many doomsters will be pulling their hair out. And as I have been saying, as long as there is no recession, the markets will continue to go up. The markets look for earnings growth and price accordingly and as long as we are in a profit friendly environment, enjoy the bull ride. The one issue on the horizon is the debt ceiling debate, which the market has already taken into account imo. However, should there be a negative surprise then it could drag the economy and the markets along with it. If it happens, it would be similar to the Fiscal Cliff in that we would only see the markets get nervous at the last minute. China and the HSI are rallying tonight and I am about to lock in profits on 30% of the longs but I'm debating to do it today or early next week. 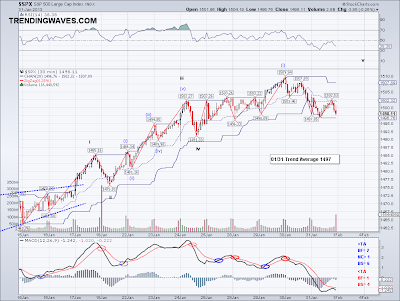 HSI reached 23,600 so just 200 points short of the 23,800 level I had been looking. And if we get that 5th leg tomorrow, I will be loading up on VXX to hedge which ironically closed higher today. The market managed to do it again today by not doing much other than putting in a slightly new high at 1473.96, just $0.50 shy of the high for the entire wave from 666. 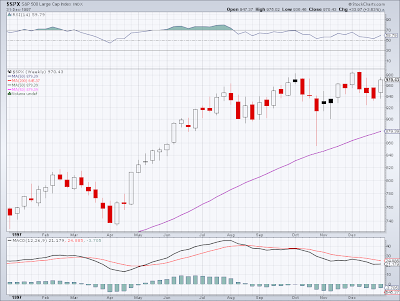 And while the market continues to look bullish to me due to the trends and the recent chart pattern. I am now also looking at a possible rising wedge, obviously it's not very steep but all these marginal new highs and higher lows makes this a real possibility. And usually this pattern breaks to the downside (69% of the time), if the highs were at the same level it would be a bullish set up. So it's make or break time for the market as consolidation has now gone on for a while and these marginal new highs are enough to call it a 5th wave. I continue with my longs but today I added 1/3 of my anticipated hedge, so 1000 VXX at $25.78. If it breaks out, then I'll be adding more at $24+? and if not then I'll make some money too. And speaking of volatility, it's worth noting VXX closed at $25.50 and this same ETF was about $100 a year ago. So be very careful if you buy this ETF and I would advise people to stay away from the triples like UVXY as this one will literally bury you if the market goes against you. Today it breached $13, the price last year was $410! so that's $3 out of $100 (and I thought nothing could beat Prechter's Elliott Wave shorting advice!) while the VIX was $18 last year and $13 today. Another day of suspense in the markets. 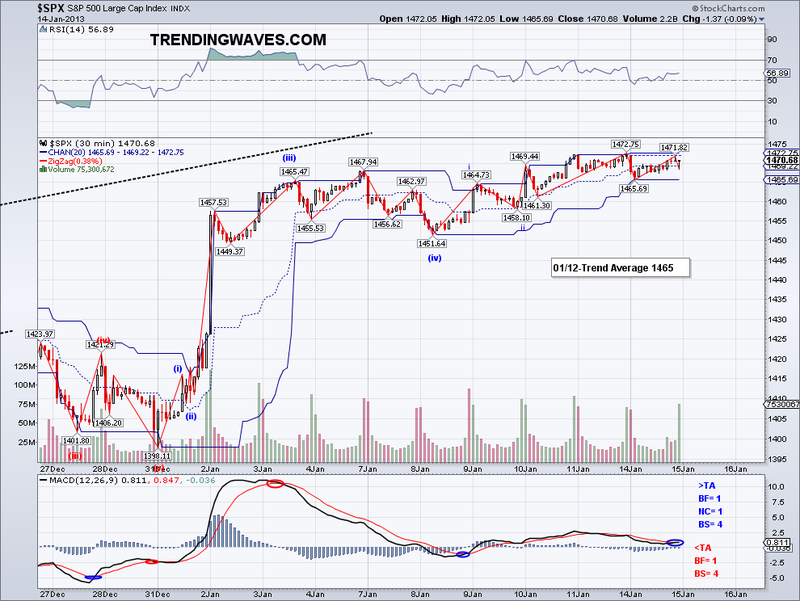 However, a slightly new high was made at 1473.31 which is now literally pushing against resistance. I am guessing lots of traders have their short stops at the 1474-1475 and like I said last week, a break of these levels is not going to be like the boring moves of the last 10 sessions, it's going to be a rally. Support levels have been holding quite well and shows lack of selling interest at this point, so unless something bad headlines the markets, there should be a bullish break out fairly soon. Then again, we could just endure another 10 days of boredom before we see some action. The market managed to pull another exciting session today by doing the same thing as the last 8 sessions. And in 2 years of doing this, I don't think I remember a stretch this long where the market just bounced around for half a month. The chart sort of reminds me of Atari's Ping Pong game from the 80's (if you can remember that far back! 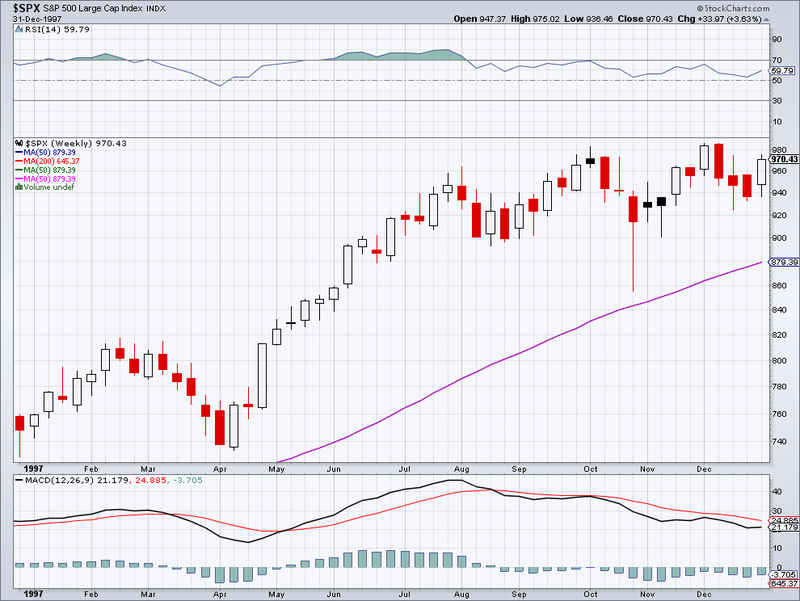 ), but despite the consolidating look there has been higher lows and higher highs. In fact, I can see the 3 rising valleys all over again. Difference this time is these are mini valleys so we'll just have to wait and see the break out. I was hoping China's 3% rise yesterday would translate into something here but it didn't even register. That market (along with the Nikkei) has now gone up close to 20% in just over a month and that this rate, I'll be retired by the end of the year.. technically speaking, all it needs to do is rise 5% a month for the rest of the year and I'll be in Easter Island next Spring :-) If life was only that easy..
Lastly, I wanted to add that the Trend Average has officially caught up with the market as the low today coincided with the TA. So expecting a 2(VIX) move very soon.. also, VXX breached 26 today so if we get that rally it will be at my target price range of $25. The market took a break today by consolidating the gains from yesterday and it seems like the real 1474 challenge will be Monday. The market almost made it to 1473 so technically it is already challenging the high but what I am looking for is a bullish attempt to break this resistance level. Despite the market consolidating for over 6 sessions, there hasn't been any significant retrace so I am assuming if we see a break out that it will be quickly reversed. A good downside target after the short term top is in will be 1449, so that will be a good level to take profits on shorts should the correction decelerate around that level. Hopefully the break out will be early next week so I can finally by the VXX position, I haven't made a short term trade in almost a month now. 1474 to be challenged Monday?